We had a little story yesterday that gave us a laugh and hubs thought I should share! Hubs was busy so kiddo and I decided that take & bake pizza was a must for dinner. I searched for the perfect (meaning not expired - LOL) coupon and found it! I called in the pizza. And off the kiddo and I went to run a couple errands and then get our pepperoni deliciousness. When we got there, I parked across a row from the pizza place. I like to send the kiddo in alone to pick up the pizza - good practice for being polite, handling a transaction, and not being afraid to do things on his own as he gets older. I handed him the cash and the coupon. He's such a good thrifty kid that he reminded me about my stamp card (which earns 50% off a pizza when full), so I handed him that too. He then started messing around and dropped the coupon in the car on purpose. He picked up the coupon and I told him to *please* hold on to it all tightly and he said "of course" and headed in to the pizza place. After a few minutes, I started watching the door as it usually doesn't take that long. Then I saw him come out - no pizza. What?? I saw him start talking to a young man who came out at the same time and they started looking all over the ground. "Oh no," I thought to myself, assuming he had dropped the cash. After they were heading my direction still looking around, I started to get out of the car to find out what was going on. My son headed over to me while I noticed that the young man was talking to somebody driving down our row. Turns out my son dropped the coupon! He waited in a small line, and when he got to the cash register to pay he had the cash, the stamp card, but NO coupon! The lady asked him what it was for (probably to give him the benefit of the doubt) and he had no idea. He walked away and looked all over the floor in the pizza place - nothing there! He walked outside and that's when he told the young man that he dropped his coupon. They couldn't find it anywhere on the sidewalk or in the parking lot. Then the young man heard my son call out "Mom" and thought he was calling to the person driving down our row. So the young man started telling the lady in the car "Your son dropped his coupon and can't find it anywhere." And she was obviously very puzzled, saying "Whaaat????" Then the young man realized that my son came over to our car and this lady he was talking to was the wrong person. Oops! My son overheard him say, "Well that was awkward." LOLOL! Poor guy was just trying to help a kid out! We could not find that coupon and went back into the store. A nice young couple knew what had transpired and offered us their extra coupons in case one of them was the right one. One was just right! I thanked them very much and we finally got our pizza - at the coupon price of course!!! We still looked for that coupon on the way back out and in the car but never saw it anywhere. Hopefully you got a smile or giggle from our fun, though maybe it's one of those "had-to-be-there" stories. 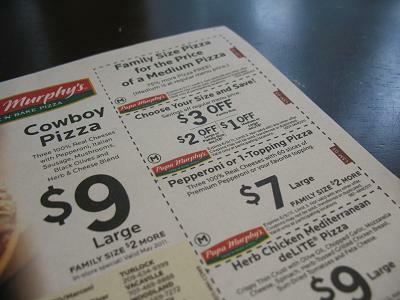 Are coupons that important to you? Enjoy the rest of your weekend friends! LOL! I say pin it to his shirt like they used to do in grade school! I'm sure he'd never lose another coupon again. Ha! Ha! I really enjoyed this my friend. Big pizza without a coupon doesn't taste near as well size hugs to you! LOL Kim - pin it to his shirt!!! Good idea Kim! Lisa...we would like a photo of this on the next pizza pick up trip, lolol.